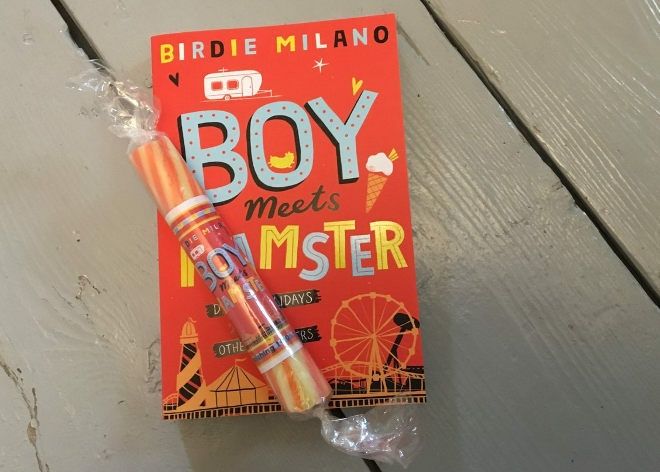 Full disclosure, my review copy of Boy Meets Hamster arrived with a stick of rock. A themed stick of rock striped in the book’s colours and with the book title running right through the centre. So let’s just say I was pretty well disposed towards author Birdie Milano before I even read the first page. But beyond exquisitely en pointe bribery, the concept of this novel immediately grabbed me. Quite simply, this is one of the most inclusive YA stories I’ve had the pleasure of bumping into. Fourteen-year-old Dylan yearns for a dream holiday, but ends up on a budget trip to caravan park Starcross Sands. When he lays eyes on the beautiful boy in the caravan next door, he’s certain things are looking up, but his best friend Kayla’s not so sure. Nibbles, the giant hamster who serves as the park mascot, “with a perm-grin and two massive back teeth,” seems to be wherever Dylan goes, much to his distaste. Dylan’s little brother, Jude, has cerebral palsy, “which is a medical condition where his brain gets a bit muddled about telling his body what to do.” Jude also has a tendency to honk when distressed, and an ardent passion for said-hamster. Their paramedic parents are embarrassing on a whole range of levels. And Jayden-Lee, Dylan’s potential love interest, is incapable of speaking without saying something ignorant and cringe-worthy. Each of these characters is utterly believable. They’re flawed, complex and capable of redemption, even those you might prefer to abandon tied to a miniature train’s tracks (and yes, that happens in one scene). These are people with more than one side to their personalities. In some cases they’re still figuring out who they really are, and that makes them all the more credible. Birdie summons the spirit of the British seaside and sensibilities with everything from Elvis impersonators to garden gnomes, not to mention fairy-themed hen parties, and plenty of mayhem thrown in for added laughs. Comedic set pieces are stunningly visual, with Dylan always at the centre of them and never quite knowing why. There’s thievery, football, meat-related catastrophes, and in the midst of it all that a dancing gigantic hamster, not to mention the possibility of Dylan’s first kiss. The real magic of the story, however, lies in its emotional depth. This is a technicolour daydream rippled through with glitter and laughter, but the true beauty shines through in uncertainties Dylan faces, and overcomes. Though intended for the YA market, this book is the perfect summer read for anyone who’s ever survived the intensity of a teenage kiss, or a UK caravanning holiday. Boy Meets Hamster is by Birdie Milano and published by Macmillan Children’s Books. It’s available to buy from Amazon. Seen or read anything interesting recently? I’d love to know. I’m always happy to receive reviews of books, art, theatre and film. To submit or suggest a review, please send an email to judydarley(at)iCloud.com. 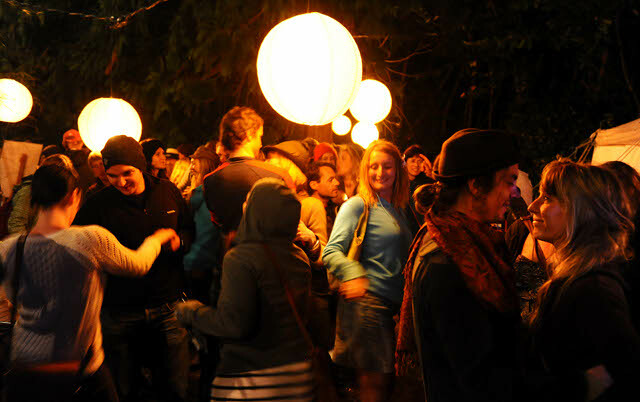 Port Eliot Festival brings together some of the best creative talents around and plonks them in the midst of a magical sprawling garden party. 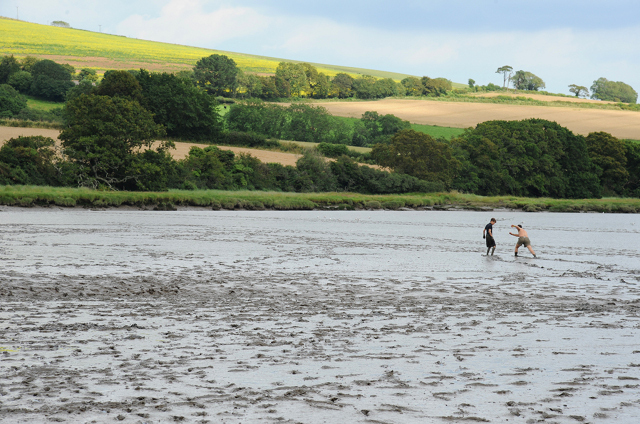 It all kicks off on 26th July, running till 29th July, at St Germans, West Cornwall. This year’s speakers, performers, mixologists and events include poet Hollie McNish, Helen Pankhurst, Robert Webb, Lucy Mangan, Tim Clare, Salena Godden, Geoff Dyer, Three Cane Whale, Salena Godden, Savannah Miller, Raleigh Rye, and so many others. Look out for Travel Writing for Adventurers, the Great Diary Project, and Mindful Masculinity with Caspar Walsh. There are also exhibitions to be inspired by: In The Round Room, you’ll find live play readings and poetry performances, a Virtual Reality installation, and late night screenings… There’s also the brand new Cinematheque celebrating women in film, Midnight Trapeze & Circus School, and Museum of Witchcraft Nightwalks. Each of the stages have names that seem plucked straight from fairytales: Lark’s Haven, Walled Garden, Flower and Fodder, The Idler Academy and The Dead Man’s Fingers bar, being just a few. It helps, of course, that the surroundings are some of the finest SW England has to offer, with historical attractions including the oldest church in Cornwall – St Germans Priory Norman church. 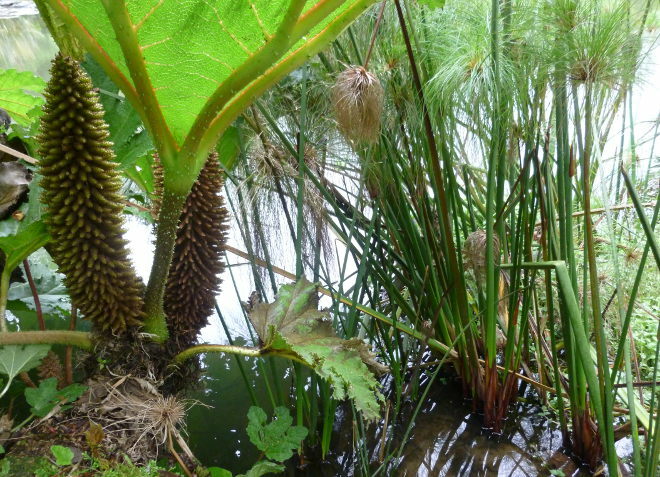 Natural delights range from the Grade 1 listed park and garden, to the estuary. 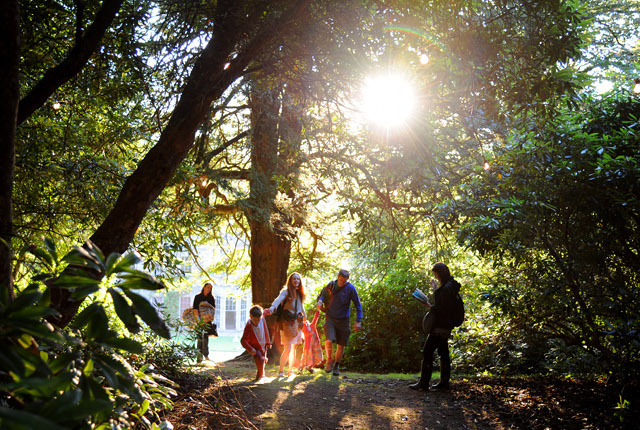 Take a Bee Trail Workshop, go stargazing, try Canadian Canoing or enjoy a mid-summer wassail. Now, that’s my kind of party. 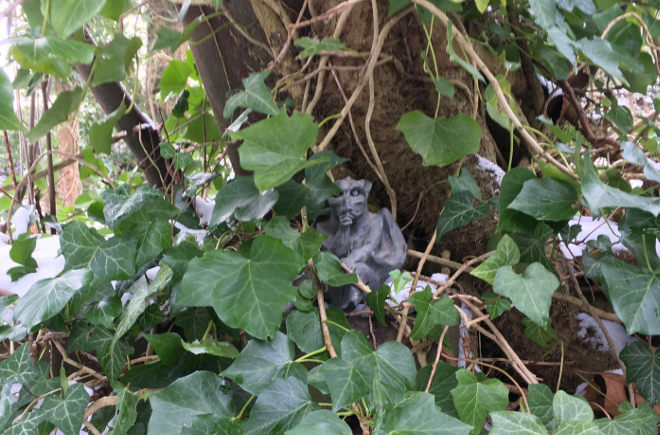 Imagine, a small stone goblin appears in a forest. Where did it come from? Did someone leave it there? If so, why? Imagine, one day the goblin disappears as mysteriously as it arrived. Where did it go? Did someone take it? If so why? What happens in the time these two events? What will happen next? Puzzle out the answers to each of these questions, even if you don’t intend to share them all with your readers. Just knowing them will help to give your writing clarity and depth. On Saturday 16th June I hosted a Flash Walk as part of the National Flash Fiction Day celebrations. We invited competition entries on the theme of Urban Landscapes, between 40 and 400 words in length. Wonderful submissions arrived from all over the world, which we managed to narrow down to 12 winning entries. 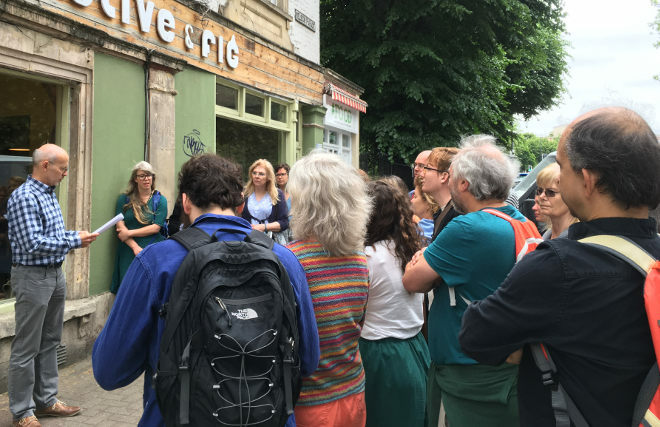 The stories were performed by actors Ashley Green, Christopher Ryan and Poppy Hocken, during the #FlashWalk from Bristol’s M Shedon Bristol Harbourside to The GreenHouse It was a wonderful to lead our audience across the city, and attract a few curious folks along the way. The rain held off until the very last story! Wasafari magazine invites submissions of Poetry, Fiction and Life Writing for its New Writing Prize. Each category offers a top prize of £300 plus publication in Wasafiri. The competition is open to anyone worldwide who has not published a complete book in their chosen category. Entries for Fiction and Life Writing should be no longer than 3,000 words, and Poetry submissions should comprise no more than five poems. The closing date is 5pm GMT on 13th July 2018. Prize winners will be announced on 25th October, 2018. Find full details of how to enter at www.wasafiri.org. Get a feel for the kind of thing Wasafari likes, read Anubha Yadav’s short story, The Beauty of Reality. This year’s judges are include Malika Booker, who will be judging the poetry, Kerry Young, who will be judging the fiction, and Elleke Boehmer, who will judge the life writing category. Wasafiri Editor-in-Chief Susheila Nasta will chair the judging panel. Got an event, challenge, competition or call for submissions you’d like to draw my attention to? Send me an email at judydarley(at)ICloud(dot)com.